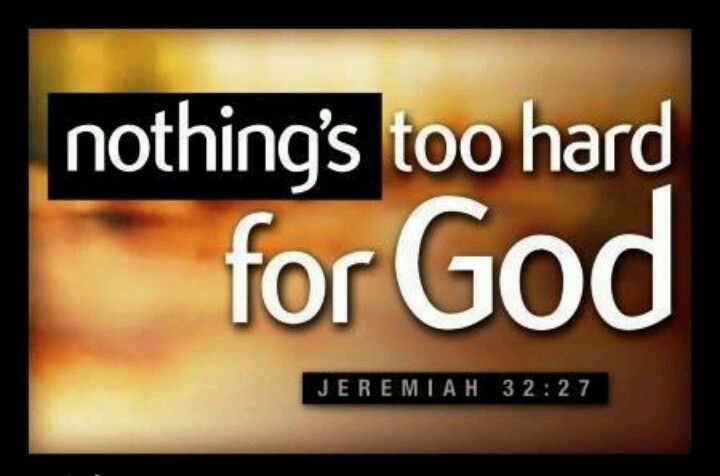 Nothing is too hard for Me to do, says the LORD. NOTHING! Absolutely nothing! For I Am Almighty. I Am never too late! I Am never oblivious of what is going on, and I Am NEVER absent. You can depend upon My power! You can rely upon My Wisdom! You can KNOW that I AM in the midst of you all the time, says the LORD. I Am not a silent observer, there to sympathize with you only, but the comfort that you have from Me by My Spirit is more than that. I am the All-Powerful One that is the Supreme, the uncontested, HELPER. I will help you, and you will have everything that you need, because I Am good for it, says the LORD. Dare to believe, says the LORD, for the word, “Impossible,” does not pertain to Me. I Am your sufficiency in all things and I Am all that you have need of. I Am on your side and you are not helpless. Fear on every side does not have to accompany trouble that is on every side. Make Me your only fear and know that as you reverence Me and revere My great Name, I will give you all that you have need of, bring you out of trouble and furnish you for every good work that I have ordained for your life. You will never be unfinished business in My kingdom, for I will complete every good work that I have begun in you. That Work is progressing in you, and it shall be a complete and perfect work of MY grace that will unfold, be exposed and confound and defeat the enemy, says the Lord. Amen! Be my Almighty Restoration and Helper! AAAAAAAMMMEENNNN AND AAAAAAAMMMEENNN YESSSSSSSSSSS LORD THANK YOU HOLY SPIRIT. WOOOOOOOO HOOOOOOOO I BELIEVE RECEIVE AND CLAIM THIS POWERFUL WORD DECLARATION IN THE MIGHTY NAME OF JESUS AND ALL GLORY TO GOD ALONE AAAAAAAMMMEENNNN AND AAAAAAAMMMEENNNN! We Thank You Lord God…Amen. Praise honour and glory to God almighty father, I believe it and thanks blessed God, Amen. God made all things by His will and by the power of His Word so nothing is hard for God to do. Jesus is the eternal Word of God that became man so there’s nothing hard for Jesus to do. He cure sick people by the power of His Word. He raised the dead to life by the power of His Word. But He did not do miracles to unbelievers,that’s the reason why Jesus did only few miracles on His hometown because of their unbelief.